Fantastic to see the latest episode of the Great British Food Revival. Well done BBC and the Chefs. At BigBarn, of course, we have been singing the praises of English apples and mutton for years and pointing out the lack of English apples and varieties in the supermarket. 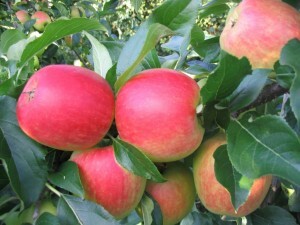 The best way to get really good apples is to 1. have your own trees, or 2. buy from your nearest orchard or farm shop. Or 3. DEMAND English apples next time you are in the supermarket and COMPLAIN if they are more expensive than foreign ones. At BigBarn we would love to see every village/community have an apple day where growers, however small can swap varieties and take any excess to press for apple juice or cider. And consumers can buy apples, trees, juice and drink last years cider. If you have an apple day please tell us and we will put you on our local food & drink map. Now mutton: Meat normally has better texture and flavour if it has been allowed to mature. Mutton has traditionally been thought of as a 5 year old barren ewe sent to the school kitchen rather than the ‘blood & bone’ fertiliser factory. A 2 year old lamb is a much tastier description. The best way to get mutton is to ask your local sheep farmer, farm shop or butcher using our map (they may then keep some of their lambs for an extra year) or you can buy online in our MarketPlace. So keep up the good work BBC and educate us all, we can blame the supermarkets for some of the problems in the food industry but we the customers have the power and should be more demanding. So please tell your friends about BigBarn and register your email and post code for our free emailed newsletter full of local food news, events and special offers.